During the latest 50 years, with a rapid development of dental materials, a lot of has changed in the fields of dental esthetics. Improvement of dental composites, bonding systems and development of new materials followed by computerized supporting systems has brought a new range of options when it comes to choosing the right dental and in the same way esthetic solution for your teeth. For many years, metal-ceramic crowns were considered as a golden standard in dentistry. However, these prosthodontics solutions showed the lack of esthetic appearance. When we analyze the consistency of full thickness of these crowns, great portions belong to the metal core, and the other portion is made of ceramics. This means that really thin part of the entire crown is made of ceramics which leads to the lack of the translucency of metal-ceramic crowns. That is why the difference between the crown and natural tooth was so obvious. The next problem was related to the soft tissue around the crown i.e. gums or marginal gingiva. Over the time the metal of the crown usually appears and become visible under the gums as a “metal shadow”, giving the unnatural look to the entire restoration. Besides this, during the tooth preparation for the crown, thanks to the small lacerations of the gums, gum staining may occur as a result of metallic ions diffusion to the gums. This phenomenon is not related only to lack of esthetic with these restorations but also to the biocompatibility of the material, and in this case incompatibility. Biocompatibility is considered as one of the major characteristics when it comes to choosing the right the optimal material. From the need to overcome named imperfections, development of new materials with improved characteristics was necessary. Therefore, full ceramic crowns appeared as an ideal solution for overcome esthetic and biological flaws of metal-ceramics. In general, the advantages of full-ceramic crowns are related to better esthetics and biocompatibility. Since entire prosthodontics restoration is made of ceramic or combination of zirconia and ceramic, better translucency can be achieved and followed by more natural and lifelike look of the crown. The marginal gingiva creates better and more intimate contact to the ceramics compared to the metal alloy which made full-ceramic crowns more suitable especially in the esthetic zone. On the other hand, a problem with full-ceramic crowns was addressed to their mechanical characteristics: its brittle, flexural strength and fractural toughness. Ceramic is hard material but, in the beginning, its brittleness has often brought to a failure of these crowns due to cracks and consequential fractures. The introduction of zirconia among dental materials has revolutionized esthetic dentistry. 1. Glass-based (silica) ceramics also known as feldspar ceramics. Well-known are VITABLOCKS Mark II and VITABLOCKS TriLuxe from Vita Zahnfabrik, Germany. 2. Glass-based with fillers (crystalline or lithium-disilicate). There are 3 subtypes inside of this group and each subtype represents an improved version of glass-ceramics. To improve physical and esthetical properties of silica ceramics, fillers have been added. Mainly leucite fillers in order to improve translucency. Further technological development leads to usage of aluminosilicate and lithium oxide as a filler. Leading material from this category is IPS e.max ceramic from Ivoclar Vivadent, Liechtenstein and VITA Suprinity from Vita Zahnfabrik, Germany. 3. Crystalline-based with glass (alumina) fillers. 4. Polycrystalline solids, monophase ceramics, known as zirconia-oxide. With the expansion of ceramic products on the market over the last 20 years, few companies improved their technologies and increased the area of indications of their products. That is why different ceramic systems have developed. Since there is no such material that can satisfy all esthetical and mechanical needs for crowns in different area of the jaw (due to different chewing forces), with the right knowledge and advice from your dentist you can have the perfect veneers, inlays, crowns or bridges that can answer to all mechanicals and esthetical requirements. Considering all advantages and disadvantages of the available materials on the market, in our dental office full-ceramic crowns are made of zirconia core (DDCubeX2, DDCubeONE, DDBioZX2 and DDBioZ from DentalDirekt, Germany) with ceramics fused to zirconia. The amazing esthetical, biological and physical properties of zirconia has made it competitive to metal alloy, previously used for crown’s core. Its translucency allows better esthetical appearance. 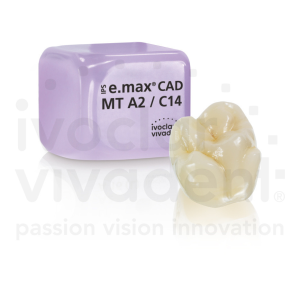 Beside this, we produce full ceramic crowns with IPS e.max, VITA Suprinity, VITABLOCKS Mark II and TriLuxe. 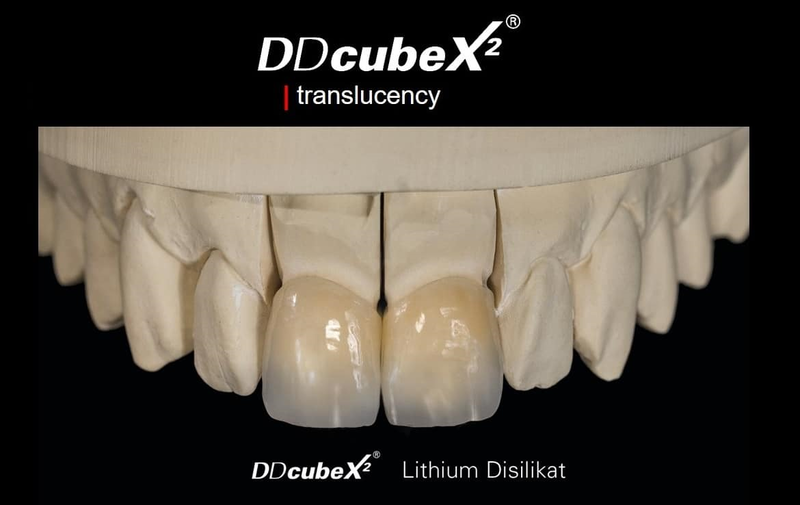 IPS e.max is lithium disilicate glass-ceramic that is on the market for over than 20 years and has proved its quality until today. This material is ideal for veneers even non-prep since it can be fabricated and successfully indicated for the thickness of 0.3 mm. It is also indicated for minimally invasive crowns (with 1 mm thickness) but also for all kind of restorations like inlays, onlays and overlays, which allows the best possible alternative to conventional composite dental fillings. 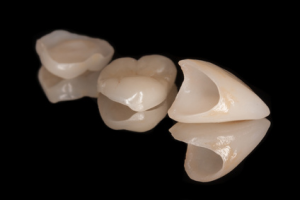 Based on its physical properties, this material can be used in the frontal region for 3-unite bridges, but when it comes to the molar region, IPS e.max is not the material of choice in this area. A completely natural look of the tooth is possible to achieve with this material even in the cases of a non-vital tooth that has changed the colour. 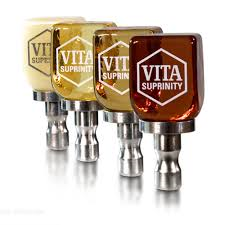 VITA Suprinity is specially designed glass ceramic material reinforced with 10% zirconia dioxide and that way improved load capacity, better precision compared to conventional lithium disilicate ceramics result in the improved edge stability and better dimensional stability. With all these improvements of physical properties, esthetic requirements have not been disrupted. This material has a wide range of indications and can be used for veneering, inlays, onlays and overlays, but also for full ceramic crowns in frontal and lateral regions regardless the chewing forces. VITABLOCS Mark II and TriLuxe are both new generation feldspar ceramics. Mark II has supreme esthetical properties and can be used for inlays, onlays and crowns. 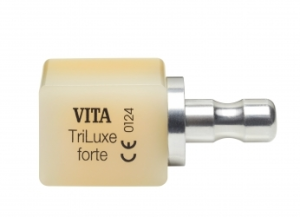 VITA’s ceramic system has been used for over 25 years with a great clinical success and presents one of the best companies on the market. TriLuxe blocks are known for their specific multichromatic structure which means that tooth shade gradient is already integrated into the block and that way natural tooth’s play of color is already reproduced. In other words, a natural transition of shade and color from the neck to the incisal edge of the tooth is already matched. One of the greatest things related to each one of the named materials is that they are compatible with different CAD/CAM systems which allows the most effective process of production with highest possible precision and the best esthetic outcome regard the shape and size of the future crown. Besides this, CAD/CAM systems allows one-visit procedures, so that way you can have your tooth prepared and leave the dental office with cemented crown just in one visit, since the complete procedure is performed in a dental office without dental laboratory assistance. This way all requirements can be satisfied in order to achieve the best possible outcome in terms of aesthetics, biocompatibility and physical requirements.